Under “Document” → “Indices and Directories” → “Associated Documents”, you can assign co-documents to your main text, which will then also be opened when you open the main text. If you are writing a novel, for example, you can choose to have your notes opened automatically every time you open your novel. These “Associated Documents” are also always available as a “favorite” under the “Document” menu. 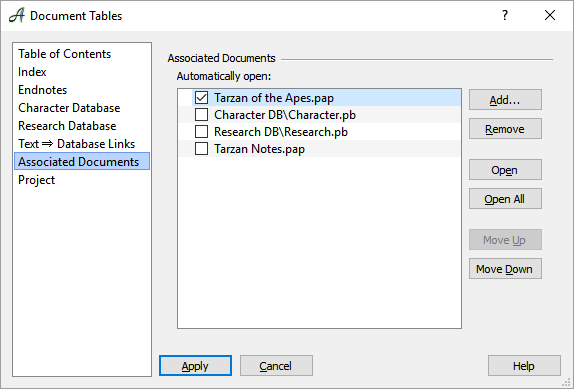 If you have not selected the checkbox next to a document, it will not open automatically every time you open the main document, but you will still be able to access it quickly under “Favorites” in the “File” menu. Associating documents with your main text allows you to quickly and easily organize texts together so you can find anything related to your main text, be it pictures, videos, songs, etc. 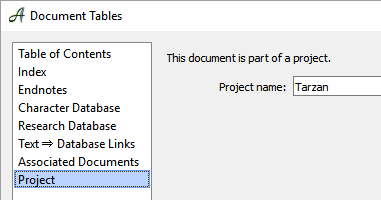 Projects automatically generate useful document associations for you.